The time has finally come – you are officially an adult and about to live in your own apartment for the first time ever. While you’re probably thinking about all the beautiful decorations you’re going to buy, there is something else you need to do first. You will have to buy some basic goods you never had to buy before. Let’s face it – have you ever had to buy your own towels, dishes, or silverware? We thought so. Moving into a new apartment can turn out to be a daunting task. There are some items that you’ll obviously need such as furniture and appliances. But, it is very likely that you may have overlooked some other necessities. Have you bought a bath mat, cutting board, corkscrew or shower caddies? You may not need all of these items, but some of them sure can come in handy. Take a look at our checklist before you finally move in your new apartment and see if you have everything you need. Consider this section as an extra short version of all must-haves. Make sure you bought all these items before moving at all. Then, keep them close by when you move. You’ll probably want to unpack these first before anything else. You definitely don’t want to find yourself be searching for a shower curtain instead of getting ready for work or class. A mattress should definitely be one of the first few items you buy for your new place. Picking out the right mattress can turn out into a very time-consuming task. You probably will be fine sleeping on the floor for one night or even a week. But, life gets crazy busy when you’re moving and you might find yourself sleeping on the floor for a month because you didn’t buy a mattress on time. We recommend ordering your mattress online from one of the many startups that have popped up in the last few years. It’s easy to have the mattress shipped directly to your new place, they come quickly, and they’re cheaper than your standard mattress. Plus they’re comfortable! We like Nectar mattresses, our readers get $125 off by clicking through this link. Besides the mattress, don’t forget to buy new pillows, bedding, and even a mattress topper if you need one. MyPillow.com has some great options for pillows and mattress toppers. When you walk inside your new apartment, you’ll probably want to decorate it somehow. And, it is also very likely that you’ll need to put something together, for example, a bookshelf. When that time comes, you don’t want to be unprepared. There is nothing more frustrating than being in an unpacking groove only to realize you lack the basic tools. Make sure you have a hammer, a screwdriver, wall hooks, and some nails. Amazon Basics has a great home maintenance toolkit to get you started. What are the chances for remembering to bring a step stool with you in your new apartment? Make sure you put it on the top of your checklist. A step stool can be extremely valuable during unpacking, especially if you’re short or if your apartment as high ceilings. It is recommended to buy a step stool that is light, easily portable, and easy to store. It would be a bummer to unpack all the things in your new home only to realize that you don’t have anywhere to plug them in. Make sure to purchase batteries, extension cords, and power strips before moving so you could finish unpacking as quickly as possible. Check out our house cleaning checklist to make sure you’ve covered all the bases! Talking of bathroom essentials, here is another one you shouldn’t forget. After a long day of unpacking, you’ll probably be dying for a hot shower. And, using a shower without a shower curtain is a great way to ruin the floors in your brand-new apartment. To prevent this from happening, make sure to pack all the toiletry items you might need, including a shower curtain. We absolutely love a well-outfitted kitchen, check out our list of kitchen essentials to see our recommendations on everything from flatware to pots and pans. For more tips, check out our moving checklist to make sure you’re all prepped for your big day. A small rug – a small rug is a great way to decorate the entrance area. It is also quite useful since people can use it to wipe their shoes. A lamp – if your entrance area is too dark consider buying a table lamp or decorative wall lamps. Decorating your bathroom can be quite fun. And now that you can buy all the bubble baths and hair products you want, you might get a bit carried away. If you get too excited about choosing the right soap that you forget to purchase a toilet scrubber, this checklist will save the day. Small rug – a great way to add some color to your bathroom. Hand and bath towels – now that you have your own apartment, you can finally upgrade your old towels to more luxurious ones. You can even have them match the color scheme in your bathroom. Toilet paper and toilet paper holder – yes, we already mentioned toilet paper. But, this time we want to remind you to get a toilet paper holder as well. Trash can – don’t forget to get a trash can for your bathroom. Trash cans with a lid are very useful and they can also make your bathroom look sleek. Toilet brush and toilet plunger – you should make sure to keep your toilet clean all the time. If you have more than one bathroom, get a toilet brush and plunger for each one. Other items – if you want to impress your guests and turn your bathroom into an oasis, consider buying the following items: candles, potpourri, small vanity mirror, additional lighting, flowers, countertop storage. It is impossible to think of all the items you will need in your kitchen all by yourself. This checklist will help you get all the items you need to cook like a boss, keep your leftovers properly, and, most importantly, host awesome parties. Kitchen furniture – this depends on your apartment and your preferences. You can get a kitchen table and chairs or only bar stools. Spices – you can have the pots and pans, but you still won’t be able to do any cooking without spices. Don’t forget to buy salt, pepper, paprika, chili powder, oregano, and garlic and onion powder. If you’re really into cooking then also buy some cinnamon, nutmeg, thyme, ginger, and cloves. A filtered water pitcher – a water pitcher will make your tap water even safer to drink and it will also taste just like bottled water. Here is the room that you’ll probably spend the most time in. Here are some items that will turn your living room into the perfect place for relaxation and hosting friends and family. Comfortable couch – let’s face it, the centerpiece of every living room is a couch. Make sure that your couch is comfortable (so you can host parties or movie nights) but also that it matches your style. Coffee table – a living room would look empty without a coffee table. This simple piece of furniture is very useful but it can also help you express your personality. Don’t forget to buy coasters to keep your coffee table looking petty! TV and TV stand – getting a TV is always a great investment. It is definitely not an essential item for your living room, but it can be great for throwing movie nights or enjoying your favorite TV shows. Lamps and extra lighting – neither you nor your friends would enjoy spending time in a dark living room. Add some style and functionality to this room by picking out cool lamps. 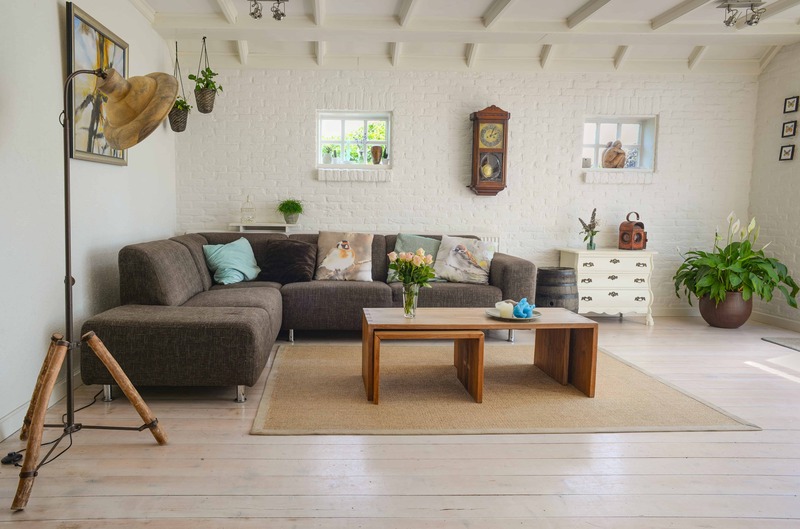 Storage – every room needs some sort of a storage solution including your living room. You can buy shelves or a TV cabinet and store your belongings there. Decorations – these items are not essential but they can make your living room look and feel homey. Consider buying houseplants, vases, candles, wall art, decorative pillows, and even side tables. The only thing you need in a bedroom is a bed, right? Well, not really. Here are all the other items you’ll need to make your bedroom a cozy place. Bed frame and box springs – we’ve mentioned that one of the first things you should buy for your new place is a mattress. But, you’ll also need something to place the mattress on. There are so many bed frames available. Make sure to pick the one that fits your needs and the size of your apartment. Document folder – you will want to bring all your important documents to your new apartment. Make sure you have a proper place to keep them. Cleaning supplies – sponges, microfiber cloths, anti-bacterial wipes, bucket, mop, multi-purpose spray, wood cleaner, bathroom cleaning spray, baking soda and white vinegar, rubber gloves, hand soap, dish soap. Don’t worry if you don’t get all the items at once. Moving in generally requires lots of trips to the store. However, to make things easier for you, you can plan those trips in advance. For example, you can start by buying the things that are a must. Then, you can do the shopping for each room separately. Don’t spare any money on essential items. They should be high-quality items since you will have them for years and, hopefully, you won’t have to buy them the next time you move.